Embroidered with a single name or initials in your choice of thread colour and letter font style. You get two classic cotton mens handkerchiefs in this set. You get two classic cotton mens handkerchiefs in this set. 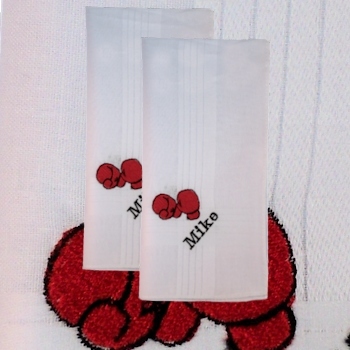 A fantastic and unique gift for lightweight to heavyweight boxers everywhere. Optional gift presentation, please choose from the options menu and fill in a name to be personalised. Personalised gifts are bespoke and made to order - usually within 48 hours.